“(…) Suitably for a boat named after the Greek goddess of beauty and splendour, Aglaia is also a gorgeous-looking yacht. Chief among her charms is the painting by Norwegian artist Magne Furuholmen on her Code 1 sail, which at about 3,600m2 (both sides of the 1,787m2 Cuben Fiber sail) is one of the largest fabric paintings in the world. 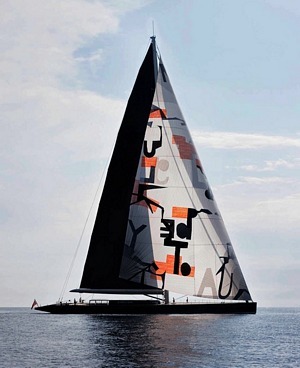 The owners had a series of Furuholmen pieces on board and after the christening chose to make his art a more integral part of Aglaia’s DNA – by putting his work on her sail. Furuholmen was given no specific brief and he told the owner he would make no sketches (‘you’re going to have to trust me’). Aglaia is owned by Norwegian billionaire Kjell Inge Røkke. The controversial business man is supposed to have paid around $100 million for the luxury yacht, which was launched in March 2011. 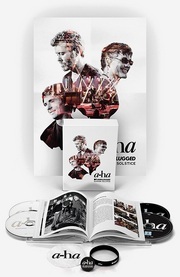 Aglaia also includes art by Magne’s good friend and fellow artist Nico Widerberg. More pictures of Aglaia, with Magne making a visit onboard, can be seen at photographer Lars Gundersen’s website at lars-g.dk.